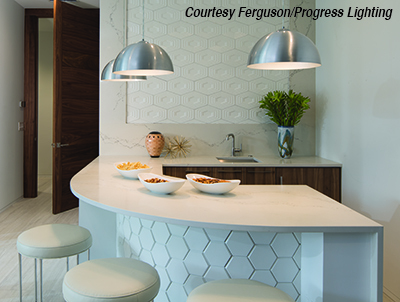 Whether building or renovating a home, homeowners continue to show interest in establishing a “man cave,” creating a place of refuge and relaxation for the man of the house. Experts point out that man caves are as individual as the men who inhabit them. Richard Friersen of Absolute AV Consulting notes, “There are as many styles as there are people with homes; from an underground grotto to a sleek, modern industrial feel and all points between.” The goal is to create a space that is personal and both a refuge for relaxation and a multi-purpose hang-out for fun. Designed for a guy to do guy things or a space to share occasionally with his family, there are some features of a man cave that don’t go out of style—space for gaming and entertainment, as well as separated from the rest of the house for privacy. Bohnne Jones of Decorating Den Interiors says, “A man cave needs to provide privacy and generally incorporates a television. The necessity to incorporate technology and/or access to technology is increasing as our desire for these devices increases. While technology is important, things such as room automation, including lighting control, shading control, and the ability to control all these things via asmart phone or tablet are becoming essential. Teresa Zilinsky of Teresa Zilinsky Interior Designs says. “Men love their technology. Today they can have security, lights, television, draperies, and shades all linked to a phone app. They love theirlarge screen televisions set up for gaming and watching sports, and they also like a game table for playing poker or other card games.” Zilinsky adds that all these areas need adjustable lighting and suggests putting lighting on dimmer switches for easy control. 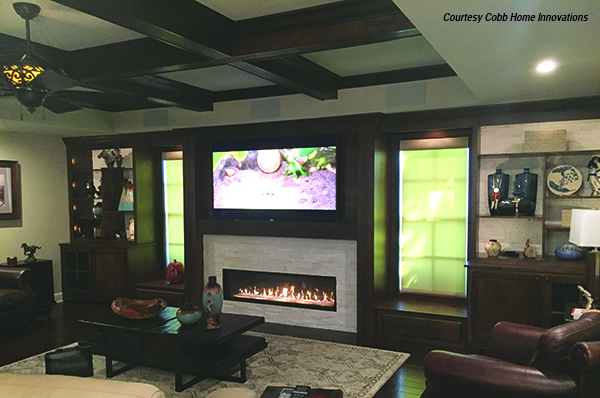 Hugh Cobb of Cobb Home Innovations has his own thoughts on the family-friendly man cave, “The whole family is part of the ‘Man Cave’ experience,” says Cobb. “This room is a gathering place for the family to spend time as a family. We are creating an experience with the room, much like a theme park creates an experience on its park rides. The room must be user-friendly, comfortable, and just plain fun for the whole family.” Whether inside or outside, or both,the space is becoming an inclusive space centered around the man who lives in it. The “man cave” typically reflects what the man of the family desires for entertainment and relaxation without necessarily pleasing anyone but himself and his buddies. One of the most important features of the space is that the décor reflects the man and doesn’t reflect the same design as the rest of the home. For example, a personal bar and plenty of shelving for displaying collections and memorabilia are essential. Beyond technology, there are other trends popping up as part of this evolving space. Men are creating a personalized space wherever they can find it. While bigger, grander, and more elaborate may always be better, there is a growing trend for mini-man caves, a space as small as a walk-in closet with customized décor and personal touches. This means that even in a crowded, chaotic home, a man can carve out a little spot of his own. For a take on a totally different approach, a man could buy a caboose. Not long ago, THE WILSON POST in Lebanon reported Thurman Mullins, a Murfreesboro native who now lives in Wilson County, purchased an old red L&N Caboose at a farm equipment auction and renovated it into his own personal space. 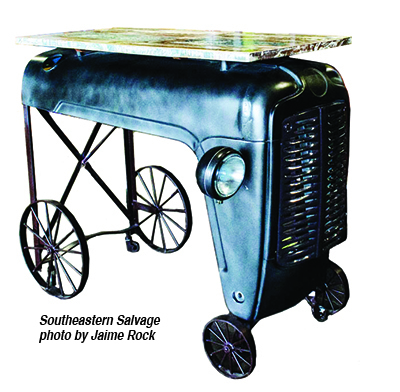 His getaway on rails features a wood-burning stove, books, old records, old toys, military gear and railroad memorabilia. Thurman says, “It’s a den that’s not connected to the house. Most of the stuff I have in there are memories,” says Mullins. Mullins’ wife Ann points out, “It turned into a really neat project,” though upon initially hearing the news that he had bought a caboose, she recommended he put it “behind the creek,” where no one would see it. Joining mini-man caves and old train cars are bar sheds or backyard bars. Bar sheds are what they sound like, a bar created from a backyard shed. In the U.S. the bar shed (or brew shed) was born out of the rise in home brewing, but the idea sparked with gardeners in the U.K. where garden allotments have sheds for storing gardening tools. People began enjoying a quick beer or cocktail in these sheds, and eventually mini happy hours began. Then the buildings evolving into bar sheds became a movement. Like other man cave variations, these sheds are not just for storing yard tools or fertilizer, they are designed and decorated to carve out some relaxation in the daily chaos.